It’s time to be someone’s hero. 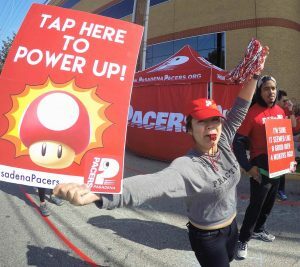 We need folks to cheer, pass out refreshments, and help make the LA Marathon a fun success! If interested in being involved in some way, shape, or form, please sign up below. Opportunities to donate and/or volunteer the day of event are abundance (scroll all the way down for volunteer slots). Please feel free to sign up for multiple spots below (e.g., cheering, oranges, water, and rakes OR running runners to tent, chocolate milk, tables, and first aid supplies). We also need volunteers to bring food for the volunteers. Breakfast and lunch items are appreciated. Because it may difficult for you to go shopping, to drop off items prior to LAM, and/or to be at the cheer tent early on race day, you can click to make cash donations specifically for the LAM Cheer Tent. The LAM Cheer Tent shopping crew will use the cash donations to buy necessary items and supplies. All donated items can be dropped off on Saturday, March 16 or Saturday, March 23 at the Pacers run. Chocolate Chip Cookies #1: Whittier P.
Gu (a box) #1: Run With Us R.
Oranges (20 cut into slices) #1: Tulia M.
Bananas - 15 (not cut) #1: Whittier P.
#5: Martha and Jordan S.
Watermelon (cut and put in trays) #1: Whittier P.
Bagels (12 cut into quarters) #1: Whittier P.
Cream Cheese (2 10 oz. containers) #1: Whittier P.
Peanut Butter (2 20 oz. jars) #1: Whittier P.
Bread (2 loaves of white) #1: Pedro R.
Bread (2 loaves of wheat) #1: Whittier P.
Jelly (for sandwiches, strawberry, 16oz) #1: Whittier P.
Pretzels filled with Peanut Butter (available at Smart & Final or Costco) #1: Rosanna C.
Mini-Salted Pretzels (16 oz. bags) #1: Rhoel D.
Nature Valley Oats'n Honey (1 box of 12) #1: gail g.
Kettle Brand Sea Salt & Vinegar Potato Chips (2 large Costco Bags) #1: Rhoel D.
Ritz Crackers (box) #1: Claudia F.
Petite/Baby Dill Pickles (2 jar to a pack from Costco Brand Wiejske Wyroby) #1: Whittier P.
Popsicles (20 each) (in cooler) #1: Lee and Jennifer B.
Orange Juice (2 gallons) #1: Whittier P.
Water (2 gallons) #1: Lee and Jennifer B. #2: Lee and Jennifer B. #3: Lee and Jennifer B. #4: Lee and Jennifer B. #5: Lee and Jennifer B. #6: Lee and Jennifer B. Water Bottles (1 case of 16oz bottles) #1: Cathy G.
Chocolate Milk (1 gallon) #1: Tulia M.
Coca Cola in can (one 12 pack) #1: Gina L.
Coca Cola (2 liter) #1: Leslie B. Ice (2 large bags of ice) #1: Lee and Jennifer B. Hot Coffee--Coffee Bean (or similar) Carton/Traveler (for Volunteers, bring day of) #1: Leanne P.
Hot Coffee--Starbucks (or similar) Carton/Traveler (for Volunteers) #1: Charles H.
Cooler (for ice and coke)-bring early on LAM day #1: John D.
Cooler w/wheels (for ice and fruit)bring early on LAM day #1: Loren B. Sun Screen 50 SPF, spray #1: Whittier P.
Rakes (for raking cups/garbage) #1: Michael R.
Brooms (for sweeping/cleaning)-bring on LAM day #1: Michael R.
Trash Cans (13 gallon size or larger - bring on LAM day #1: Michael R.
Chalk (large for drawing on street) #1: Lee and Jennifer B.
Bucket (for towels/sponges) #1: Charlene D.
Car Wash Towels (36 pack) #1: Diana T.
Dish Sponges (one dozen cut in half to make 24) #1: Charlene D.
Table cloth, red, one roll, Smart n Final #1: Ale C.
Paper Towel (large roll) #1: Whittier P.
Hand sanitizer #1: Michelle C.
Tissues/Kleenex (2 boxes) #1: Ale C.
Aluminum Foil Roll, 45 yds #1: John D.
Saran Wrap, 25 yds #1: gail g.
Aluminum Foil Pan- 10 pack (half sheet 9x13 or 7.5x5) #1: Mario H.
Vaseline jar (2) #1: Michelle C.
Tongue depressors, 1 package #1: Charlene D.
Kool n Fit #1: Carol R.
Food Serving Gloves (large box) #1: Karen L.
Running Pacers into the tent #1: Steve S.
Clean up during race (rake cups) #1: John D.
#21: Martha and Jordan S.
Food Distributer (from 9a-11a) #1: Maggie A. Food Distributer (from 11a-1p) #1: Bob M.
Drink Distributer (from 9am-11am) #1: Whittier P.
Drink Distributer (from 11am-1pm) #1: Mikki L.
CLEAN UP post-race @ 1 pm #1: John D.